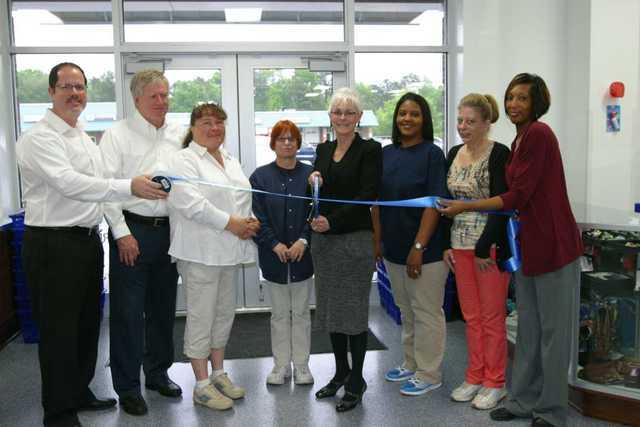 The GCF teams opened the Louisburg, NC Donation Center & Store on April 29 with a ribbon cutting. (PRLEAP.COM) Durham, NC – May 1, 2013 – On Monday, April 29, Goodwill Community Foundation of Eastern North Carolina (GCF) officially opened the employment center and store at 136 S. Bickett Blvd. in Louisburg, NC. The Louisburg GCF Donation Center & Store is the 37th employment center in the organization's 49 year history of bringing employment opportunities to communities throughout eastern North Carolina. New employment centers, including the Louisburg center, has allowed GCF to create 183 new jobs during the current period of high unemployment. GCF currently serves over 400 people through jobs at its employment centers and spends an average of $19.99 an hour in wages and benefits, which begin at $12 per hour. Often, individuals earn $18 an hour plus benefits as sorters, cashiers and utility workers. Reverend Dennis McLain said, "Our goal is to enable citizens in eastern North Carolina to earn a wage and benefits that creates opportunities for them to live a better life, because they are being served through GCF employment centers". GCF has been actively involved in creating meaningful employment opportunities throughout eastern North Carolina during one of the highest unemployment periods in history. GCF spent $22 million dollars in 2012 on program expenses at its employment centers throughout eastern North Carolina. Of that, $15 million was spent on wages and benefits at GCF's employment program centers. In addition GCF spent $7.4 million in expenses related to the capital requirements for its program facilities in 2012. "GCF receives no local, state or federal tax dollars, does no fundraising for cash donations in local communities nor does it compete with any organization for local, state or federal government dollars," said McLain. "We do thank members of the local community for helping keep their neighbors employed with meaningful work by donating their useable clothing and household items to GCF." McLain continues, "GCF has been and will continue to be a unique solution to job creation throughout eastern North Carolina. The Board of Directors looks forward to the day when every community in our territory will have a GCF Donation Center & Store. GCF's work will not be done until every person in eastern North Carolina who wants the opportunity for a better life through the dignity of work at GCF has access to one of our jobs." For more information on GCF®, visit us at www.GCFGlobal.com.